In The Broken Universe, Paul Melko returns to the world of his Walls of the Universe, expanding on both the universe count and the character count as well as greatly raising the stakes. 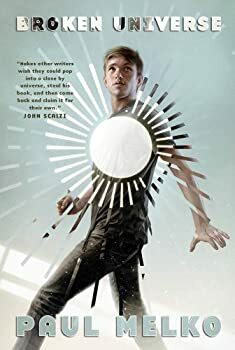 While doing so, unfortunately, he also carries over some of the first book’s flaws, making the sequel, like book one, a solid but uninspiring read. The book picks up pretty much where Walls of the Universe finished, soon after the defeat of the Alerians (since you pretty much have to have read book one to fully follow The Broken Universe, I’m going to assume you’ve done so). It’s taken them almost two months to return to their home universe, and in that time the remaining Alerians have regrouped and are ready to cause John’s group some serious problems, ranging from deadly attacks to legal assaults on the Pinball Wizards Transdimensional Company to theft of the company’s transport machines and designs. The conflict between the Alerians and John’s group is one main storyline. Another introduces a new group — the Vig — who seem to see it as their task to enforce transdimensional travel, with lethal force if necessary. Another story line involves John’s decision to move the Pinball Wizards away from simply monetary gain toward using their technology to do good, one such example being to transfer refugees from the nuclear winter world to the unsettled paleo-world, both of which he visited in book one. To deal with all three issues, the company goes on a recruiting binge, finding their duplicates in other universes, explaining the situation, and having them set up branch offices in their own universes. More personal story arcs involve John’s continuing concern that he is becoming hardened and more like John Prime and the continuing impact on Grace of her being tortured by the Alerians back in book one. The two major conflicts come to a boil by the end of the book and the violence and body count are ratcheted up pretty high by the end of The Broken Universe. The strengths of this book are similar to the positive elements of its predecessor. The focus is on John’s character as he adapts to new situations and tries to keep a gauge on himself, trying to keep himself from becoming fully like his counterpart in John Prime, and also as he begins to move into the role as an actual leader. Grace’s attempt to deal with her trauma is handled less fully, but is a welcome bit of seriousness; many authors would have just dropped the entire torture incident a few pages after she was rescued. The question of the value of a life (and of relationships) in a multiple universe continues to be explored in interesting fashion. And again, the prose moves us speedily, smoothly, and easily through a most engaging plot. Melko’s decision to raise the stakes, so that larger groups of people — indeed, entire worlds — are in danger was a good decision for a sequel, as was the introduction of new universes and a new villain. But as mentioned, if the strengths are similar, so are the weaknesses. The prose continues to be adequate but nothing that will stick in your mind for any length of time at all (as mentioned in my review of Walls of the Universe, I recognize this isn’t a flaw to everyone). Once again, too many things happen too easily, including the same problem of people accepting the entire premise of multiple universes far too quickly. The villains are again too cartoonish and too inept, plus a bit inconsistent. It’s hard to get very worked up about a villainous plot involving a board meeting, and even harder to get worked up over the villains when the board meeting they’ve stacked doesn’t do what they want. And it’s hard to imagine the bad guys giving John the time he needs to complete a certain task early on. There are pacing issues once more, in this case too much time spent on the legal issues surrounding the business. And though we see more universes, too many are too similar, and we barely spend any page time on the most interesting one. A few new issues also arise. One is that there is too much clumsy recap in the first few chapters; the narrative would have been far better served by a simple prologue separate from the story. Another is that the conflict seems to spin a bit out of control too quickly. And finally, without giving any details, I have to say the ending was a major problem for me. All of this puts The Broken Universe, like the first book, into the solid three-star category. It isn’t a bad book; if you pick it up you’ll probably end up satisfied overall if dissatisfied by aspects. There’s enough out there that is better, though, that I wouldn’t recommend it as a primary option.